Ross was a British company, founded in 1830. It is well known for its camera lenses and binoculars. 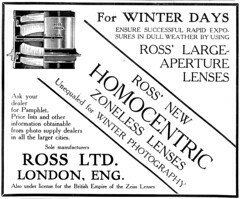 Ross had an early close association with Carl Zeiss in Jena, Zeiss licensed some Ross patent designs particularly for EWA lenses and in turn Ross had a license for the British Empire to make some Carl Zeiss lens types. Zeiss built a factory in London, mainly to produce binoculars, but some camera lenses appear to have been produced. The factory was taken over by Ross during the First World War. 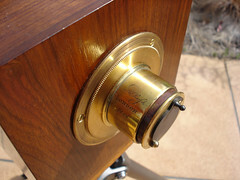 Ross also made some cameras, from about 1855 to the 1910s. In 1948 or 1949, Ross was merged into Barnet Ensign (the successor of Houghton-Butcher) to form Barnet Ensign Ross Ltd., which became Ross Ensign Ltd. in 1954. The new company continued the production of the Ensign cameras and of the Ross lenses; the production of cameras was dropped in 1961 but the company continued for some time to sell Ross optical devices such as binoculars or enlarging lenses. For the cameras made by Barnet Ensign Ross and later by Ross Ensign, see Houghton and Ensign. See their 39mm screw lenses and their Contax lenses. See here for dating the serial numbers of Ross lenses. in-shutter versions, and in sunk mounts for hand-held reflex cameras. ↑ Channing and Dunn, p.107. ↑ Channing and Dunn, pp.108–9. ↑ Channing and Dunn, p.21. ↑ 5.0 5.1 McKeown, p861. 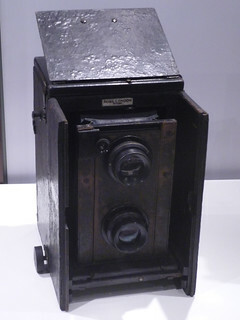 ↑ Portable Divided Camera at Early Photography: standard model from 1890 and de-luxe model with extension back, from 1897; both for 4x5-inch plates, with Rapid Symmetrical combinable lenses and a single front door. ↑ Portable Twin-lens Camera (serial no. 2!) 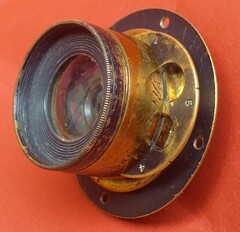 for 2½x3½-inch plates, about 1895, also with Rapid Symmetrical lenses, and with double front doors; sold at the sixteenth Westlicht Photographica Auction, on 5 December 2009. Channing, Norman and Dunn, Mike. British Camera Makers. An A-Z Guide to Companies and Products. London : Parkland Designs, 1996. ISBN 0-9524630-0-8 Pp.21–2 and 107–9. McKeown, James M. and Joan C. McKeown's Price Guide to Antique and Classic Cameras, 12th Edition, 2005-2006. USA, Centennial Photo Service, 2004. ISBN 0-931838-40-1 (hardcover). ISBN 0-931838-41-X (softcover). pp 393 and 861. Ross catalogues (pdf) of lenses, shutters and cameras at Ciné-Ressources: 1912 (without the Xpres) and 1914 with it. This page was last edited on 19 June 2015, at 09:03.